Milliner model doll all original paper mache head wood arms legs 10"
Please refer to our stock # 1975 when inquiring. This is an all original milliner doll with paper mache head and hand carved wooden arms and legs. She has on a brown/tan dress with a scalloped petticoat and full length pantaloons. All are hand sewn. She has on green painted shoes. You can see in the picture as well as feel the hand carving of the arms and legs. You can see she has crazing on her face but it is not fragile or flaking off. Her clothing is in good condition but has age related discoloring. 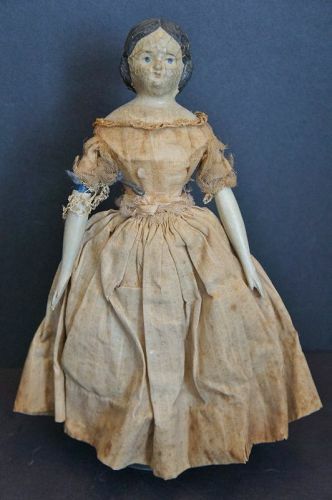 She is 10" tall and is circa 1840. This doll came out of a local attic.